Choosing a Linux distribution to run a Web site or a database is easy; Linux has handled servers well for years. Getting Linux right on the desktop, however, has always been a challenge--and that is why Ubuntu caused such a buzz when it first appeared three years ago. Ubuntu version 7.10, code-named Gutsy Gibbon, builds on past successes with improved graphics, simplified software installation, and a host of minor software improvements. As with the previous version, the first thing you notice is Ubuntu's novel installation process. Unlike OpenSUSE 10.3, the Ubuntu distribution medium is a Live CD, which means it boots to a fully functional Linux desktop, applications and all. Once you have taken it for a test-drive and made sure that it supports your hardware, all that's left is to double-click the installer icon on the desktop. The installer asks few questions and offers fewer choices, which is actually one of Ubuntu's greatest strengths. While some Linux distributions try to provide everything up to and including the kitchen sink, Ubuntu is more restrained. The default configuration is simple, streamlined, and consistent. Adding and removing applications from an Ubuntu desktop is as easy as choosing from a menu. You get one word processor, one spreadsheet program, and a single movie player. You can install whatever you want later, and adding and removing software from an Ubuntu system couldn't be easier. Installing the most prominent Linux applications is as simple as choosing 'Add/Remove' from the Applications menu at the top left of the screen and then picking from a list. Adding support for proprietary multimedia formats is as painless as possible. 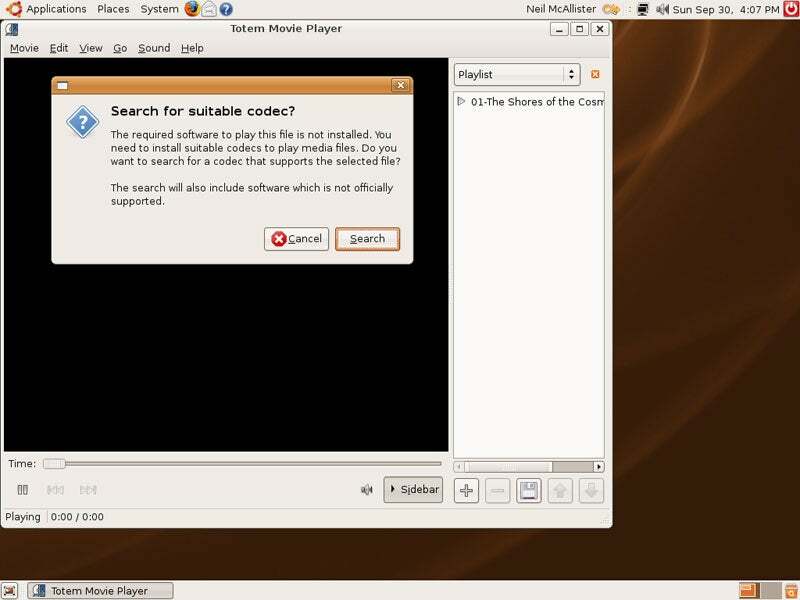 Support for multimedia formats such as MP3 and DivX has always been problematic for free Linux distributions because of patent restrictions. In the past, Ubuntu users relied on third-party scripts to load all of the appropriate content handlers. Now Gutsy has made adding support as easy as it can be, by giving you the option to install the appropriate codecs with the click of a button the first time you try to play an unsupported file. This goes for proprietary Firefox plug-ins, also, such as Adobe Flash Player. But you can forget about the iTunes Music Store, as DRM-encrypted media is still off-limits. Finding other types of content is made simpler with the inclusion of the new Tracker desktop search engine and the Deskbar Applet, which offers quick access to Web-based search engines. Ubuntu 7.10 comes with flashy effects, such as the spinning Desktop Cube, enabled by default on supported hardware. 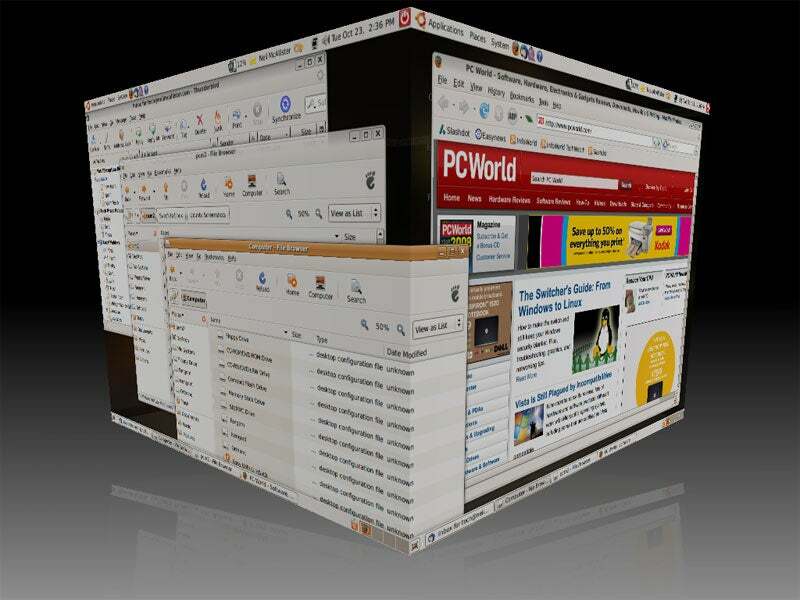 Compiz Fusion, a 3D-accelerated graphics engine, provides wobbling windows, transparent terminals, the spinning Desktop Cube, and other desktop bling. It's enabled by default in Gutsy, but users with low-powered hardware may find it too sluggish for day-to-day use. Similarly, font rendering is much improved, particularly for users with LCD screens. Ubuntu's fonts are now comparable to those of Mac OS X--a major achievement, considering the anemic type handling that Linux users were stuck with just a few years ago. One exception, however, is OpenOffice.org: Fonts look terrible in the free office suite when subpixel font rendering is enabled, a serious cosmetic bug that has affected the last few Ubuntu releases. The problem disappears when you remove the Ubuntu version of the suite and install a stock build. The release has other rough spots. Despite the presence of the latest Linux kernel, hardware support is still uneven. Power management is particularly problematic, as Suspend and Resume almost never work. On the plus side, new printer management software makes configuring local and networked printers easier. But a new feature that allows users to troubleshoot graphics card settings without manually editing configuration files seems to cause more problems than it solves, and integrating with a Windows network is still not as easy for Ubuntu as it is for some other commercial distributions. Despite those criticisms, Ubuntu 7.10 once again asserts itself as the desktop distribution to beat. 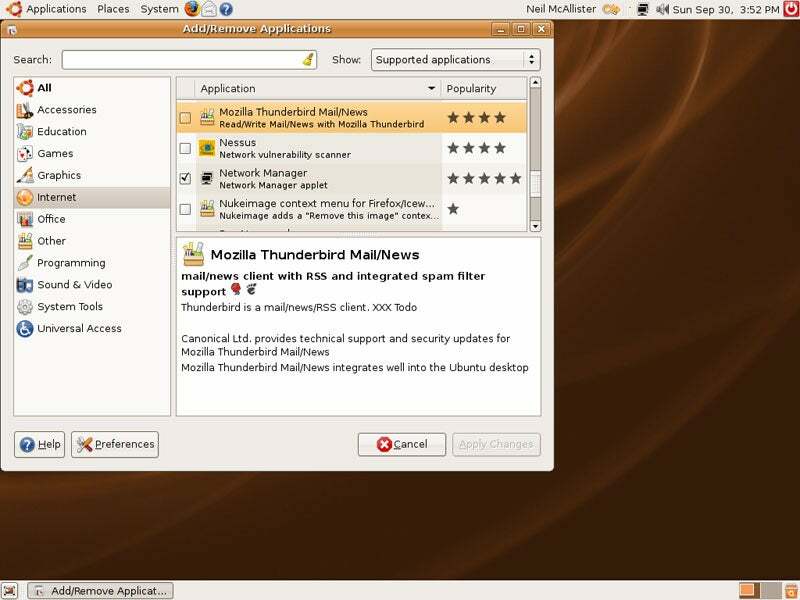 Advanced users will find a powerful, well-organized Linux distribution, while novices will appreciate the thought that has gone into Ubuntu's uncluttered interface. It may not be perfect--yet--but the price is certainly right. Read more of PC World's Linux coverage, including "How to Switch From Windows to Linux" and our review of OpenSUSE 10.3. Enhanced graphics and ease of use make Ubuntu the desktop Linux to beat.